There are a variety of plan examples that are used by businesses, project heads, and professionals. One of the most crucial types of plan examples is the procurement management plan. 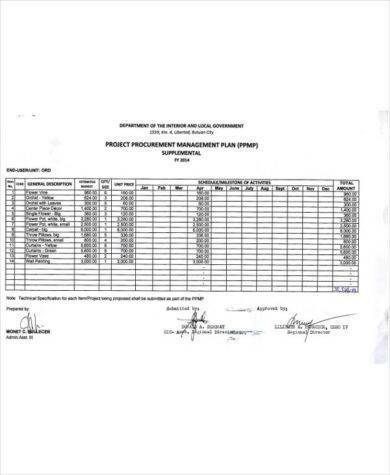 This document is used to identify the appropriate number and kinds of materials and items needed for a project. More so, it provides information about the suppliers that will provide the demands and needs of the project team for the actual project execution. 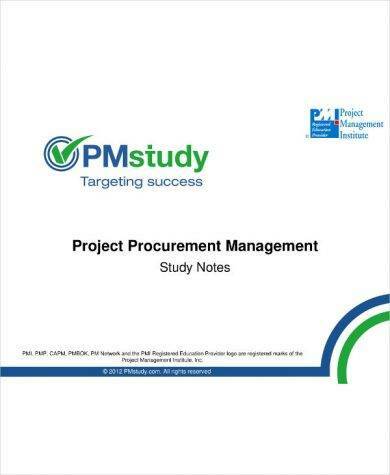 We have listed a number of procurement management plan examples so you can have guides and references when writing your own procurement management plan. 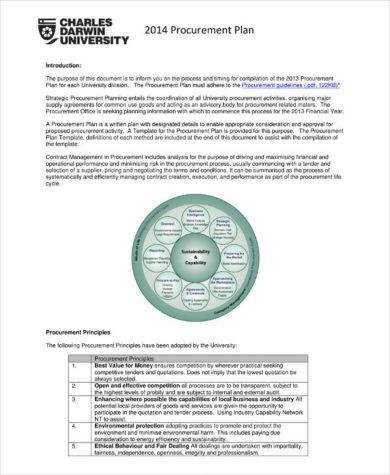 Why Is a Procurement Management Plan Essential? 1. A procurement management plan helps the project manager and even the entire project team to decide what they should buy at particular time periods. The proper and timely allotment of resources can maximize the time, efforts, and money of the project which is a great way to continuously develop the project at hand in a sustainable manner. 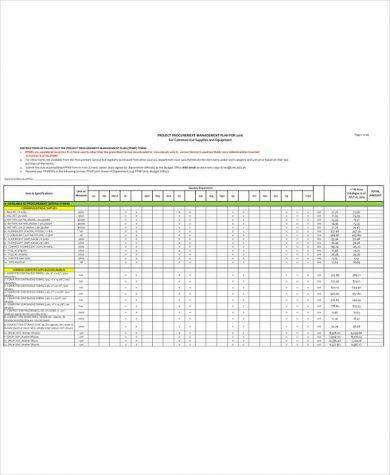 You may also see data management plans examples. 2. 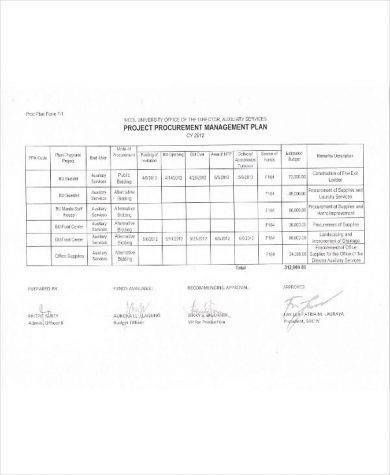 A procurement management plan ensures that the project team can select the best sources for their needs. There are different suppliers that can offer the requirements of a particular project. Through a procurement management plan, the team can easily identify the best option to take in consideration of the price offers, the quality of the items and materials, and the entirety of the supplier’s potential to give what the project needs. 3. A procurement management plan ensures that all the plans of the project are realistic and attainable especially when it comes to meeting project demands at certain time frames. A procurement management plan must be measurable and time-bound for it to be an outstanding tool that can be of help for project development. You may also see communication management plan examples. 4. 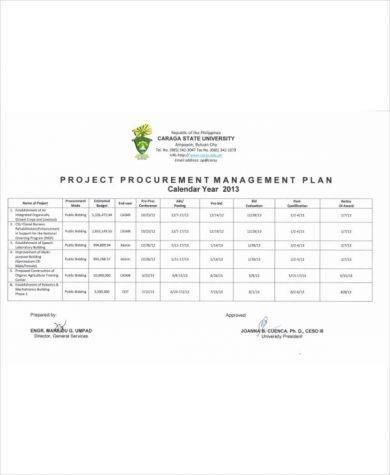 A procurement management plan helps planners and other stakeholders to collaborate with one another when it comes to the layout and arrangement of the processes necessary to achieve the set procurement objectives, goals, and requirements. Since there are different entities who will take part in the creation of a procurement management plan, it is important for project heads and managers to ensure that there are experts and professionals who will give their insights about the final draft of the procurement management plan. You may also see risk plans examples. 5. 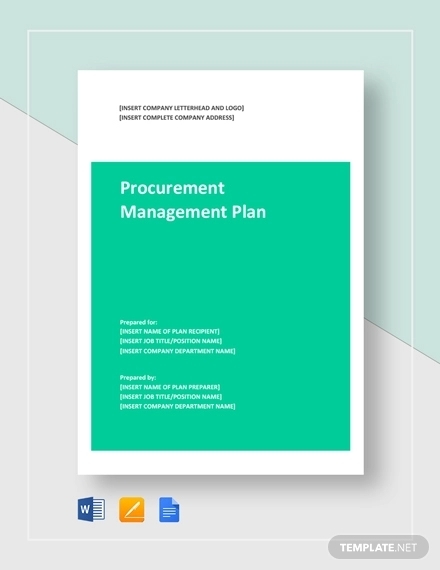 A procurement management plan ensures that there is an available procurement strategy that can be applied in all the areas and phases of the procurement process. Hence, a procurement management plan can be deemed as an organizational tool that allows project teams to be well-guided in all the steps that they will undergo in relation to procurement. 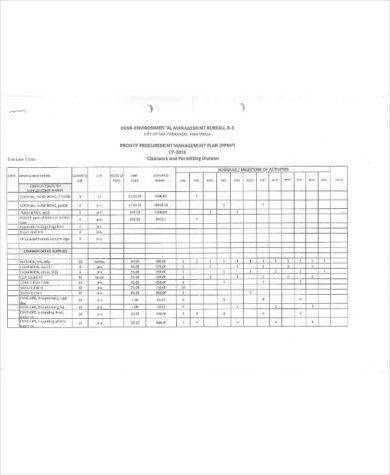 You may also see quality management plans examples. 6. A procurement management plan, like any management plan examples, gives an avenue to maintain the quality of the entire project by ensuring that the initial steps of the undertaking are strong and well-planned. 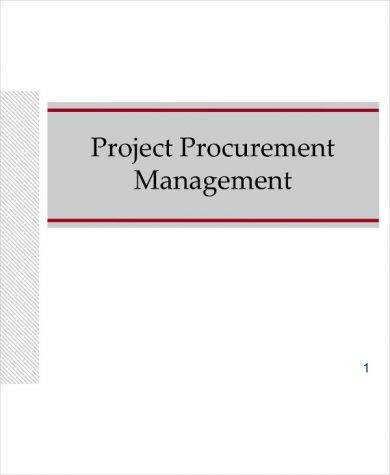 Processes within the procurement management plan do not only include material and supply acquisition but performance monitoring, workforce and staffing updating, and supplier evaluation as well. Having a procurement management plan can promote transparency enhancement within the entire procurement process. It allows all stakeholders to be aware of the updates that are happening in the procurement activities for the project. With this, procurement predictability can be identified in an easier manner. 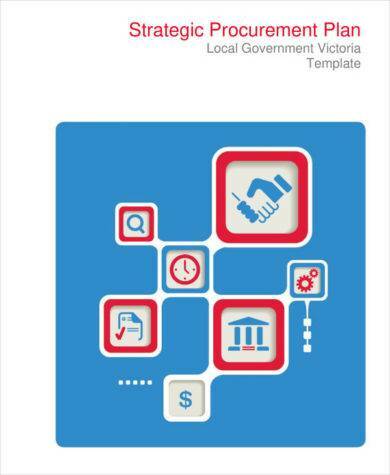 You may also check out debt management plan examples. However, you have to remember that not all procurement management plans work the same. 1. Be aware of the procurement process. It is of utmost importance for your procurement management plan to have a clause or a section that discusses a brief information about the processes and procedures that should be followed during procurement. This can help particular members of the project team be reminded of their obligations and responsibilities.You may also see performance management plans examples. 2. A vendor process approval must be developed. Vendors must be knowledgeable of the policies and regulations of the business or the project. Moreover, they should have an idea on how they can present their offers in a manner that can be easily understood by the project team. Proper usage of time sheets or other kinds of sheet examples as well as presentations must be discussed accordingly. 3. Specify all the roles of the people who will be involved in the procurement activities for the project. There are various responsibilities that are essential to be disseminated for the procurement to run as smooth as possible. 4. Know the time frame by which the resources and other supplies for the project are expected to be at hand. The timing of the procurement can affect the project a lot, which is why you have to be strategic on how you will acquire the supplies needed in all project activities. You may also like risk management examples & samples. 5. 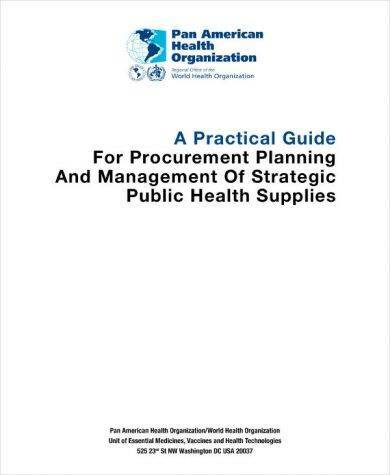 Have a list of the procurement needs that are needed to be supplied. 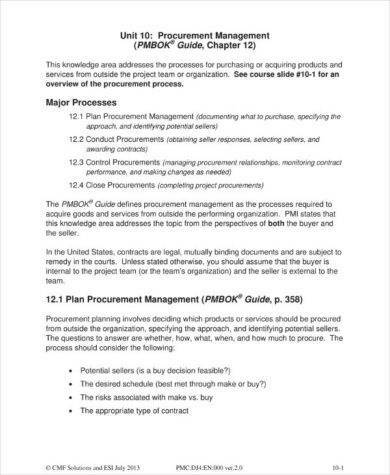 This includes the workforce, the services of external entities or third parties, and the materials necessary for procurement transactions.You may also see change management plans examples. 6. Describe how changes can be created, made, and mandated within the procurement process. Certain changes are necessary but there should be understanding on why these changes are essential to be applied. The appropriate description and explanation of these changes can make particular actions more valid, accepted, and understood.You may also see implementation plans examples. 1. 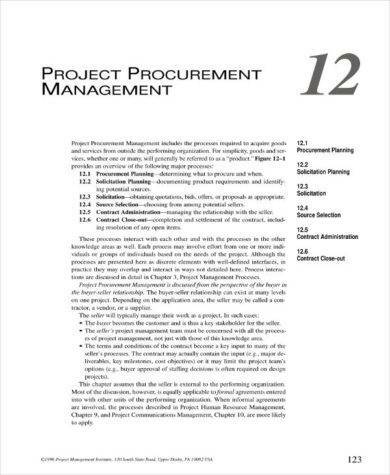 Be keen with the procurement management plan’s planning, selection, administration, and closing process. All these phases are essential to be carefully observed to make sure that decision-makers are leading toward procurement choices that are truly beneficial for the project. More so, make sure that you have a list of the agreement examples, procurement selection metrics, and vendor management plan. 2. Know the objective of the procurement management plan and associate this goal or vision with the role of the project manager. Through this, proper segmentation of the workforce can be developed, which can best contribute to the creation of great procurement decisions depending on the particulars of each project needs. You may also see crisis management plans examples. 3. 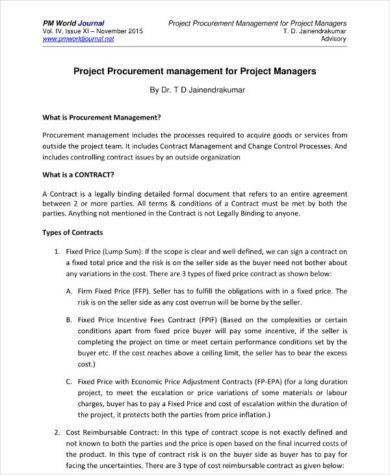 It will be great if you can define the terms, conditions, and limitations of procurement and the kinds of procurement agreements and contracts that you will use. Through this, you can protect the intentions of the project and all its stakeholders. You may also see emergency management plan examples. 4. Identify and mitigate risks. As much as possible, list down all the constraints and limitations of the project so that you can be aware of the items that you need to look into and give focus on. 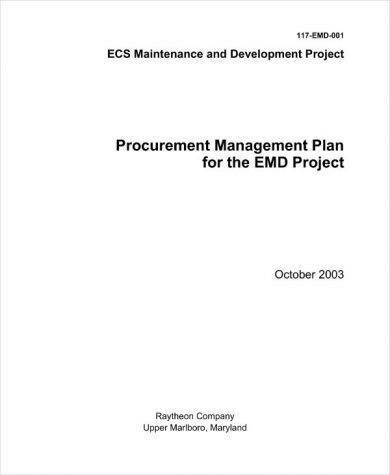 With this, the threats and weaknesses of both the project and the procurement process can be diminished or even be eliminated.You may also see behaviour management plans examples. 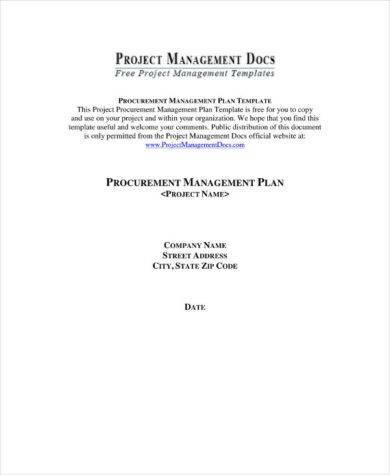 If it is your first time to create a procurement management plan or if you just want to have a more efficient time in developing your own document, use our downloadable examples for references. With the help and guidance of our tips, suggestions, and all the other information available in this post, we believe that you already have the knowledge and resources that can make it easier for you to come up with your own procurement management plan. You may also like what is a project management plan?